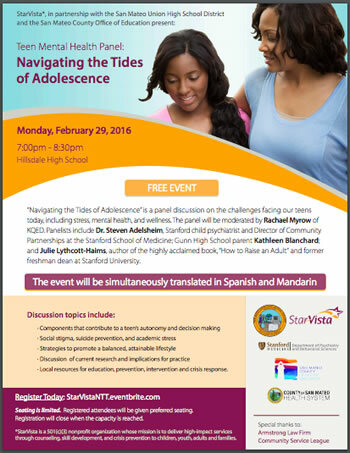 The event will be simultaneously interpreted in Spanish and Mandarin. "Navigating the Tides of Adolescence" is a panel discussion on the challenges facing our teens today, including stress, mental health, and wellness. The panel will be moderated by Rachael Myrow of KQED. Panelists include Dr. Steven Adelsheim, Stanford child psychiatrist and Director of Community Partnerships at the Stanford School of Medicine; Gunn High School parent Kathleen Blanchard; and Julie Lythcott-Haims, author of the highly acclaimed book, "How to Raise an Adult," and former freshman dean at Stanford University. Struggling with a diagnosis such as depression, anxiety, ADHD, bipolar, anger control, eating disorder, etc. Alicia Goldman LCSW has over 20 years of experience working with families, and 6 years as an Educational Consultant. She has worked in hospitals, outpatient mental health clinics, schools, and private practice as a therapist. Sharon Epel LMFT counsels parents, couples, families, teens and individuals in her private practice in San Francisco, and has also worked extensively with teens in clinic and school settings. Contact 415-341-3018 or lisaeltinge@aol.com with any questions or to RSVP. Come listen to a collection of true stories about real teens struggling with tough issues surrounding self-esteem. Hear powerful teen stories about real-life struggles with friendships, peer pressure and anxiety and how these teens learned to cope. Presented by Dr. Carol, Teen Advocate: Youth, Culture and Self-esteem Expert. Click here to purchase tickets. To learn more about this event and Dr. Carol's book, Girl Talk: Boys, Bullies, and Body Image please click here. UCSF Benioff Children's Hospital invites you to explore the many ways in which adults (parents, educators, mentors, and clinicians) can support and positively impact the development of a healthy body image in children and adolescents. Guest speakers Andrea K. Garber, PhD, RD and Daniel Le Grange, PhD will address the emotional and physical consequences of the societal pressures young people face to conform to standards of attractiveness and beauty. With an emphasize on health and wellness, our experts will also discuss how to recognize and treat eating disorders. This evening will conclude with Q&A, so please do bring your questions. Space is limited so please click here to register. Click here for access to a free online event with Thich Nhat Hanh, recorded on October 26, 2013.